Three basic pantry ingredients are all that is needed for this Ninja Foodi Apple Dump Cake! 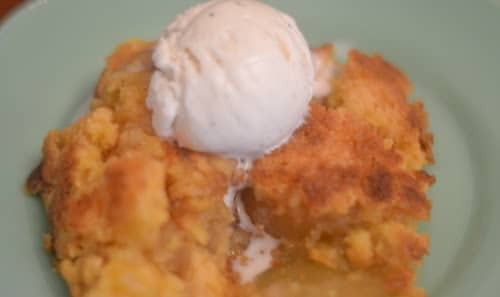 If you are a fan of dump cakes than you will be over the moon excited for this rich and flavorful apple dump cake recipe. The Ninja Foodi gives it the perfect cake crust, with a tender apple filling bottom. Dump cakes tend to be my go-to desserts for a quick weeknight dessert. I also find they are a perfect cake to make for when you have unexpected guests coming over and you want something sweet to serve with your coffee or iced tea. 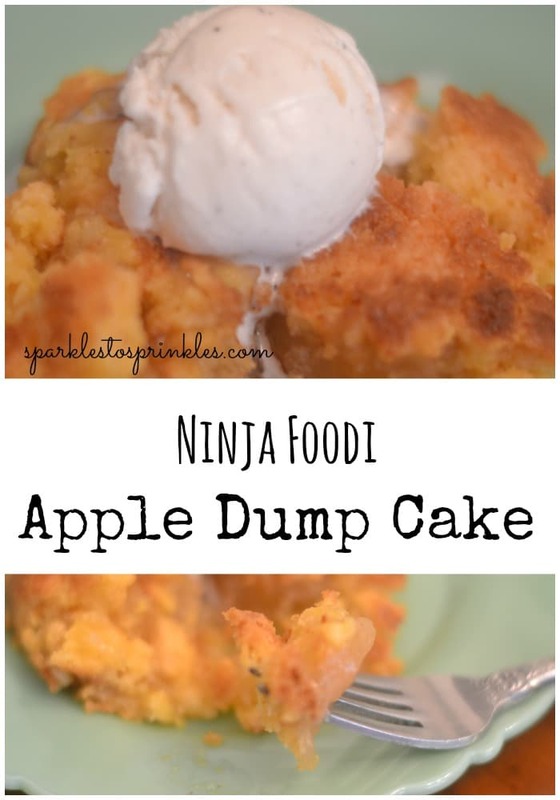 I have tried all methods of making dump cakes, from my oven to Instant Pot and now the Ninja Foodi! I must say my all time favorite way to make dump cakes is in my Ninja Foodi. There is something so magical that happens while cooking in the Foodi it enhances the flavor to all-time deliciousness levels. It is creamy, tender, and absolutely delicious and simple to make. I love to serve my dump cake while it is still warm and serve it with vanilla ice cream. For this dump cake, I have cooked it in a 9″ Pie Tin. You can also make the dump cake directly in your cooking pot. Please refer to the cooking directions for my Ninja Foodi Lemon Dump Cake, which was cooked directly in the cooking pot. 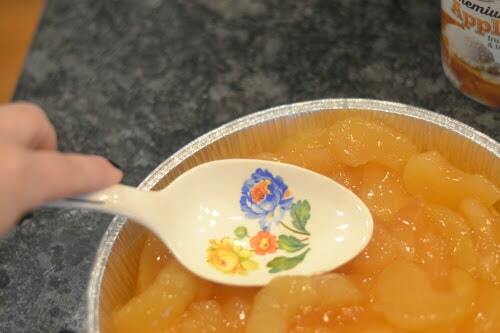 I find that using the pie tin helps make a prettier appearance if you are serving up guests. But, if it is just us our family, I sometimes go the pot route, it just depends. For this specific recipe, all that is needed is a cake mix, apple pie filling, and butter. I am totally for real on how easy it is to assemble, and you would be amazed at how decadent it turns out when all it needs is 3 ingredients. 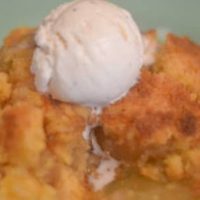 If you are new to the world of dump cakes, they are so easy. I like to call it the lazy dessert recipe we all dream about. You literally dump ingredients together, turn on the oven or in this case, your Ninja Foodi and cook. Then pull out and you have a bottom layer of filling, topped with tender and light cake. Both are very similar, and I could see how some would ask is there a difference between a cobbler and a dump cake recipe. They both have a fruit filling that is topped with a cake-like or streusel topping. Generally, cobblers go for a streusel topping that has brown sugar, flour, and oats, whereas a dump cake is a cake mix. As you can see not much effort goes into making an apple dump cake! But I will warn you, they are so addictive, and once you start making dump cakes, you will never look back! This Ninja Foodi Apple Dump Cake is so delicious you will never bake a pie again. Spread apple pie filling in the bottom. Place pie tin into your cooking pot with a sling place beneath it. Set temperature to 350 degrees and set time to 25 minutes. Open the crisping lid about 5 minutes after it started cooking. If there are any spots of cake mix that do not have butter covering it, place a piece to cover the spot. Close the crisping lid. You will want to check again around 20 minutes to make sure the top is not browning too much. Test with toothpick at 25 minutes. It should come out clean. Scoop out with a big spoon. Serve it warm or cold. With ice cream or without.